Source Capture is the most effective method of capturing industrial air pollutants. Media units utilize a series of filters to collect the particulate. These include pre-filters, media bag filters, HEPA filters, and charcoal modules. The unit can be configured with any combination of media to most effectively capture the specific dry or mist particulate or fume. Cartridge units utilize self-cleaning, high efficient, cartridge filters. These reduce filter replacement cost as the filter elements are continually cleaned by compressed air as the unit is operational. All Micro Air® cartridge air cleaners utilize the revolutionary Roto-Pulse® cleaning system. This cleaning method has proven far more effective at cleaning the filter than the traditional reverse-jet systems. Micro Air® HYDROMAX®: wet collectors, excellent for operations that generate combustible particulate, can be ducted directly to the process or to one of the WCDDT Downdraft tables to capture contaminants at the source of generation. Micro Air® source capture collectors are available in models from 100 to 6000 CFM and more with a broad range of filtration options. This total versatility allows us to recommend just the right model for your particular needs. Micro Air® provides you with much more than compliance with OSHA or other governmental regulations. Employees receive health fringe benefits; morale is increased; heating and air conditioning costs are lowered; maintenance costs on other plant equipment are reduced. 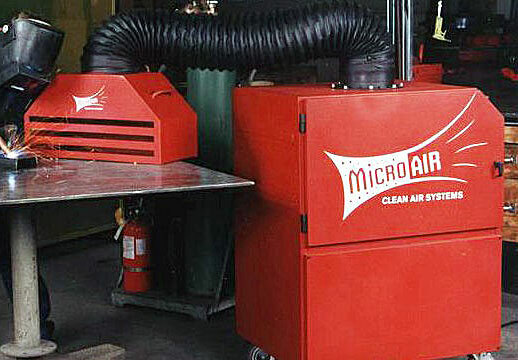 All Micro Air® products are sold by a national network of trained air cleaning professionals. In addition, we provide factory support including design consultation, CAD drawings and technical assistance at no charge to the end user.